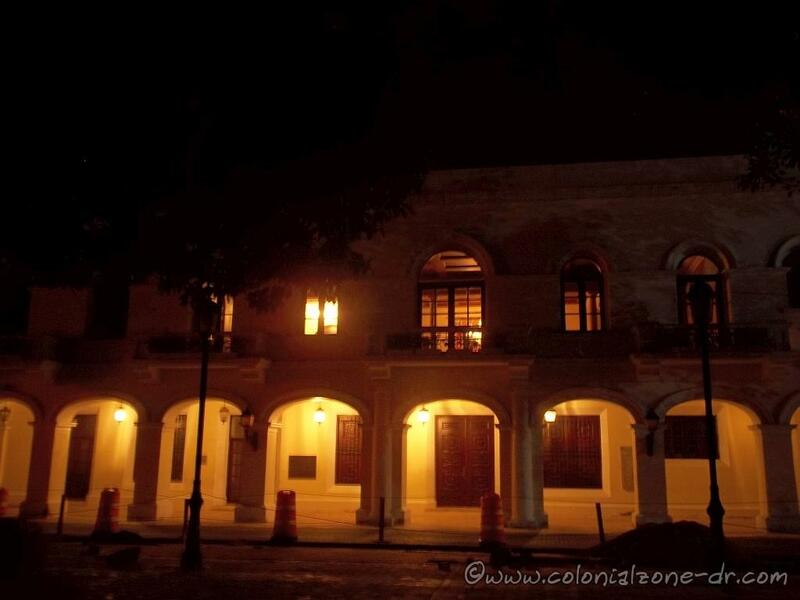 The Palacio Consistorial, located in the Colonial City / Ciudad Colonial of Santo Domingo, was the original location of the old town hall. 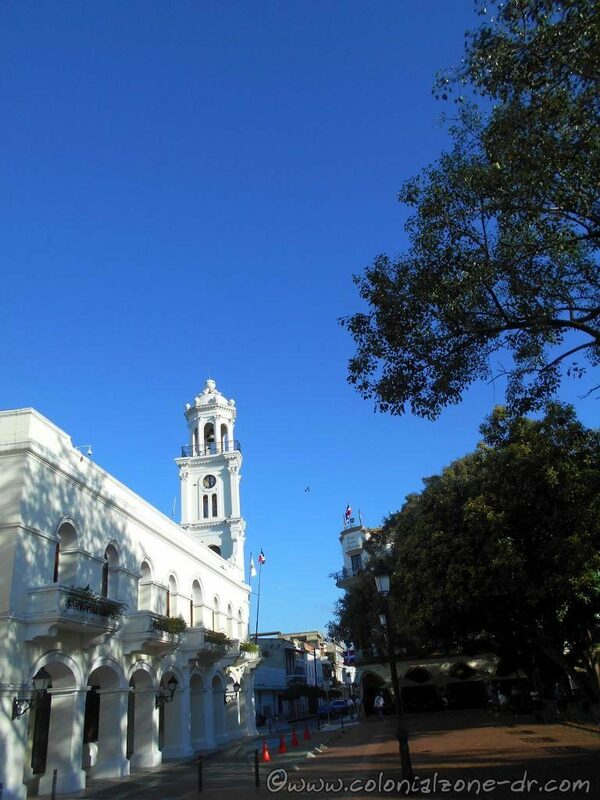 It is the oldest Town Hall in The Americas. Not only has this historical building witnessed unrivaled events in the history of The Dominican Republic, but it is also the place where many of the most important decisions of the country have been made. 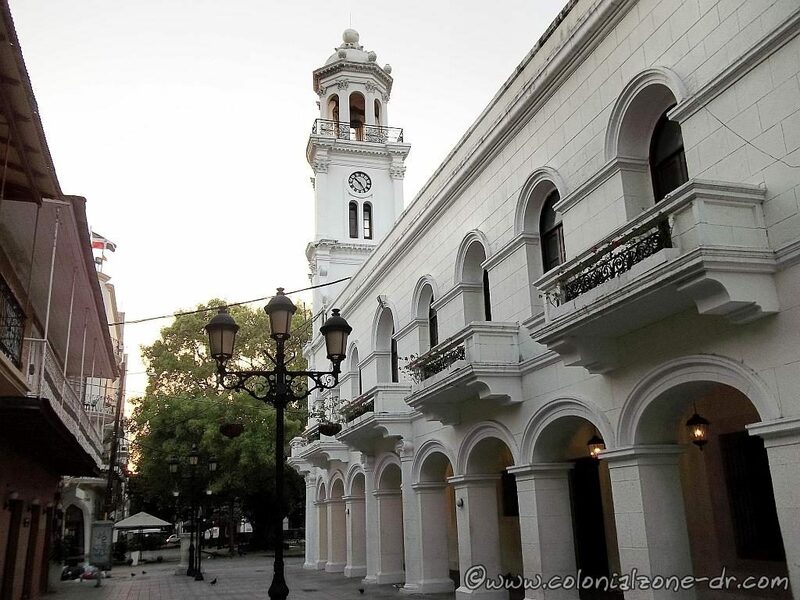 The Palacio Consistorial with its distinguishing tower as seem from Calle Arzobispo Meriño, Ciudad Colonial. The Palacio Consistorial was built between 1502 and 1504. It has been remodeled many times during its lifetime in which much of the original facade has been hidden and covered over. 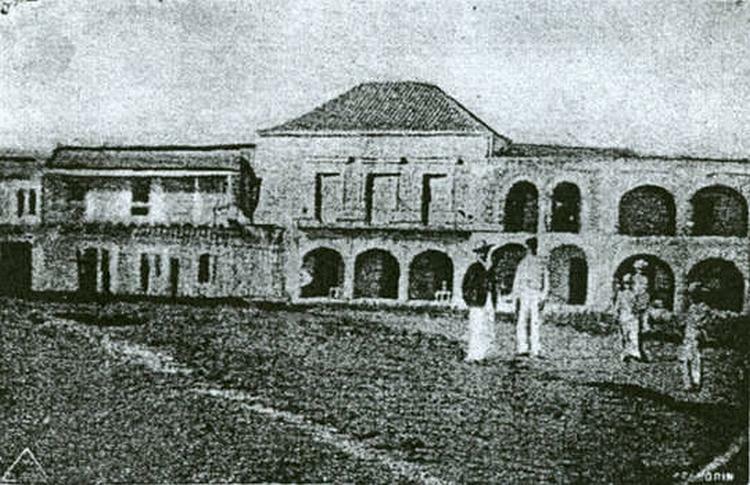 The original Palacio Consistorial (Imágenes de Nuestra Historia). The Palace was remodeled between 1911 and 1913 by the architect Osvaldo Báez Machado (Machado also remodeled the Iglesia de la Altagracia and The Hospital Padre Billini). He changed the edificio to have a neoclassical style that was very popular at that time. The Palacio has many beautiful balconies with iron railing. The porch on the ground level runs along the entire building and the second floor boasts a large curved corner balcony and small balconies with iron railing. The ground level porch of the Palacio Consistorial. 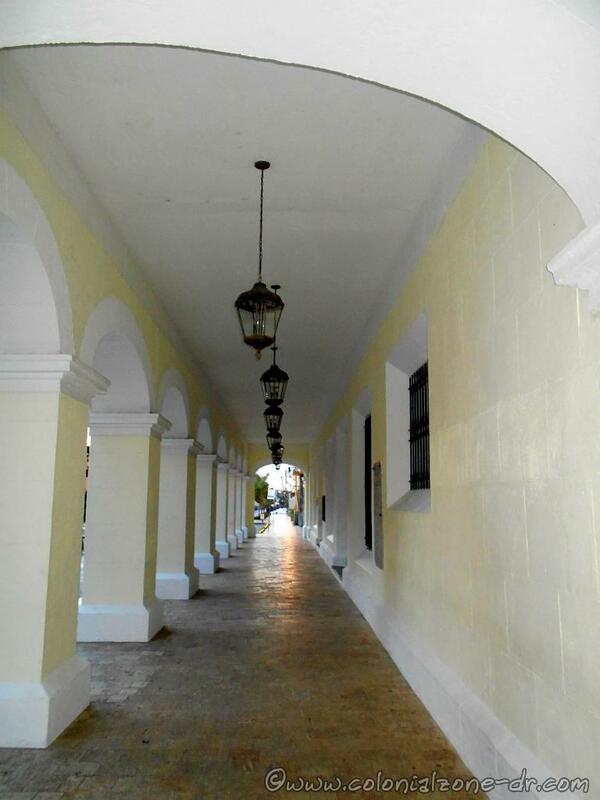 The interior of the Consistorial, also known as the Museo de la Villa de Santo Domingo, has a large central patio. It is exquisite with the beautiful fountain and surrounding terraces. An elegant staircase rises to the second floor. Along with the busts of the Padres de la Patria (Juan Pablo Duarte, Francisco del Rosario Sanchez and Ramon Matias Mella), there is a beautiful antique grand piano and crystal chandeliers. In 1939 the exiled Spanish Architect Tomas Auñón made the interior woodwork and trim. In 1944, Vela Zanneti, the great Spanish muralist, made the mural that tells the history of the city. Starting with the loves of Miguel y Catalina up to the Era of Trujillo. 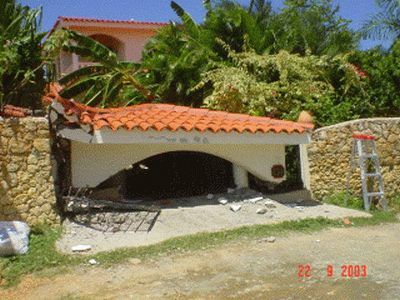 The art emphasizes the San Zenón Hurricane that in 1930 marked the beginning of the 31 years of Trujillo’s dictatorship. Palacio Consistorial has a large curved corner balcony where the clock tower rises to the crowned dome known as El Vivaque. 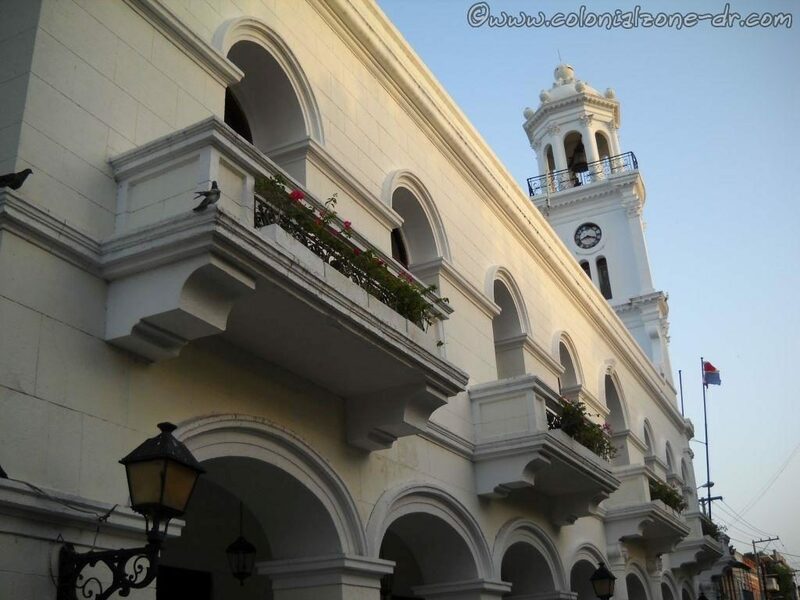 The most notable aspect of this historic building, the 95 foot high (29 meter) clock tower / torre del reloj. The tower was added during the time of Trujillo. The top of the tower has a crowned dome known as El Vivaque. The tower has a clock on its front that in old times was an important time peace in the city. Now, it is just for show. All the lights are ablaze late at night at the Palacio Consistorial. 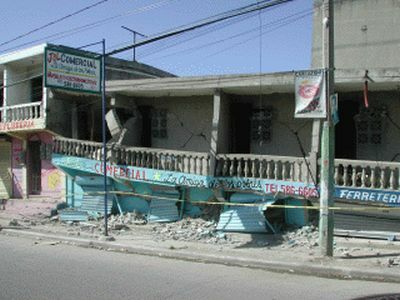 For years the building was part of the Banco de Trabajadores. For a time it was a jail and a police station. Now the building houses Ayuntamiento del Distrito Nacional. It is also a beautiful and elegant space for art exhibitions and cultural activities. 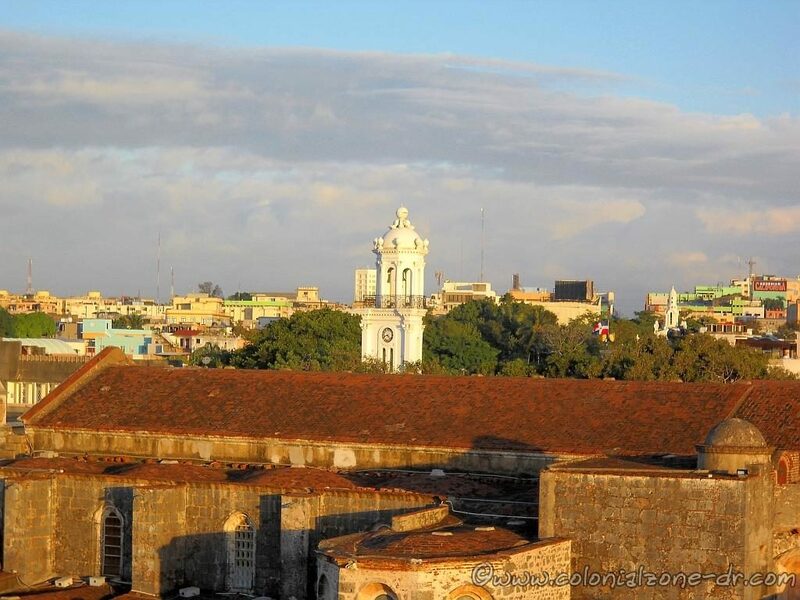 The bright white tower of the Palacio Consistorial can be seen high above the Colonial City and can be used to find your way. 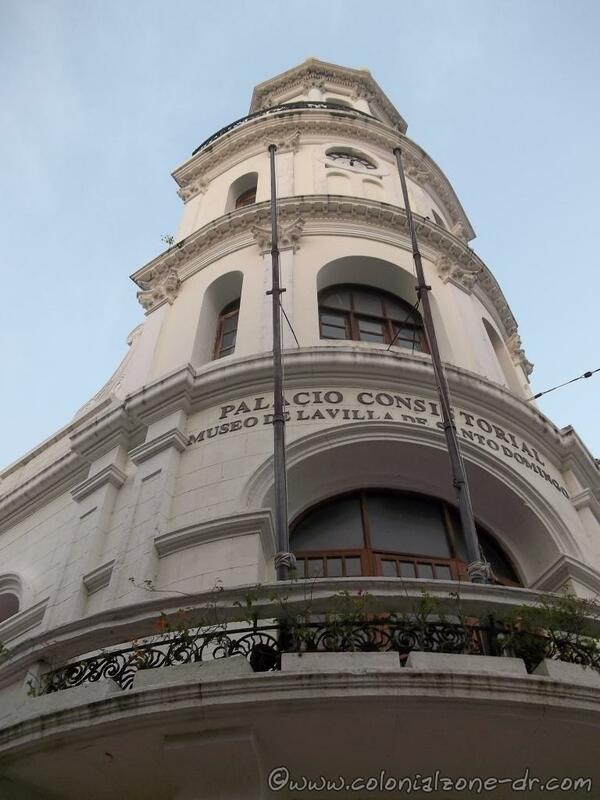 This tower of the Consistorial Palace is an iconic part of the Colonial Zone. If you lose your way in the Colonial Area just look to the sky for this tower with the clock (usually the clock is not working). This unique tower can be seen from most of the surrounding Colonial Zone area. If you become lost or can’t remember how to get back to the Conde just locate the tower and head towards it. The optical illusion. 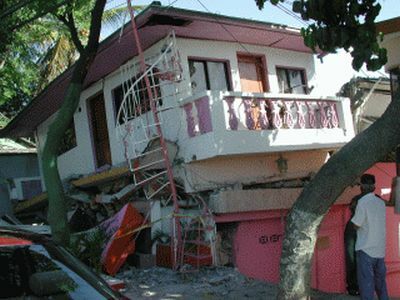 It looks like the tower of the Palacio is leaning towards the street. – The building and its tower look like it is leaning towards the street. This, I am told, is an optical illusion. 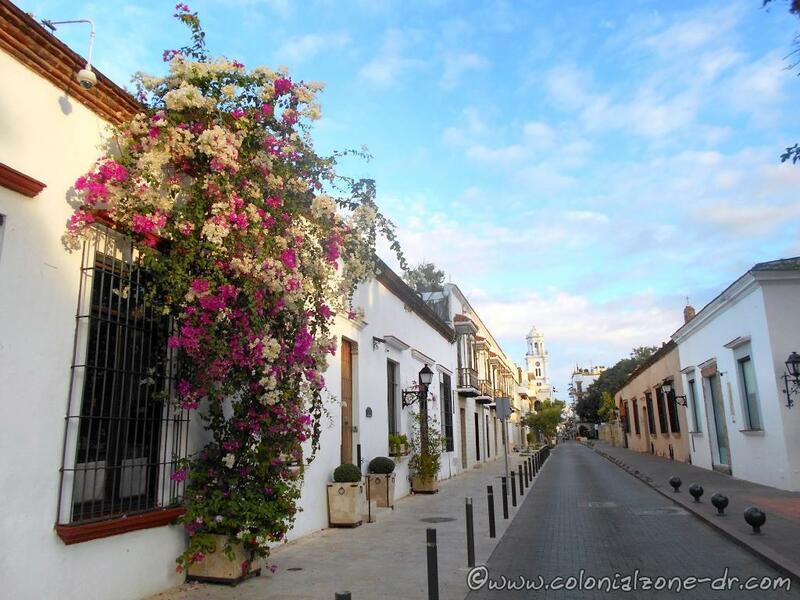 Calle Arzobispo Meriño, the brightly colored trinitaria and the Palacio Consistorial can be seen in the distance. The Consistorial Palace and the Museo de la Villa de Santo Domingo is on the corner of Calle El Conde and Arzobispo Meriño, at Parque Colon. Just look up and you will see the distinctive tower. Father – Frey Bartolomé de Las Casas was so many things to so many people. 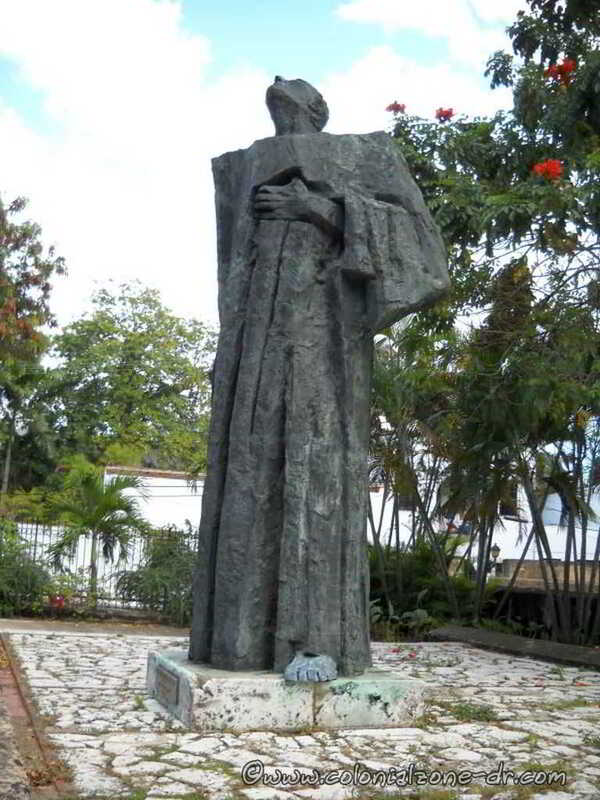 He was part of the original colonization of Santo Domingo. He fought for human rights in defense of the Indigenous peoples of Hispaniola. Frey Bartolomé de Las Casas was a Spanish colonist, a priest, a friar, the founder of a Utopian community and first Bishop of Chiapas. He was a scholar, historian and 16th century human rights advocate. Las Casas has been called the Father of anti-imperialism and anti-racism. Considered by some to be a saint and by others to be a fanatic and close to insanity. Las Casas to this day is still very much an icon. He is the symbol of justice and the fight for human rights in Latin America. He led the way for many peoples fight for freedom and human rights. So, no matter what people thought of this Dominican monk, he made a great influence in the life and culture of the world. It is interesting to note his birth and death years. 1484*-1566*. There are many different dates for the time of Las Casas birth and death. Originally it was said he was born 1474 but after some scholars did some studying they discovered he was really born much later in 1484. So now history has change and his official birth date is November 16, 1484. 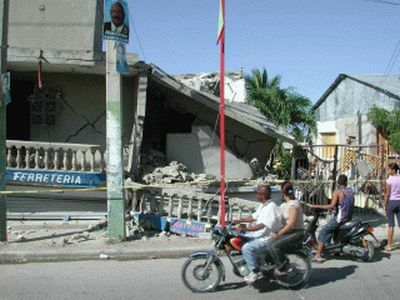 Las Casas died, some reports say on July 17th and others say the 18th, 1566 when he was either 81 or 82 years of age. Las Casas was born in Spain and studied in the Cathedral school of Sevillana. He came to Hispaniola with the expedition of Nicholas de Ovando in 1502. He participated in some campaigns of conquest on the island and left for Rome in 1507. When he returned was granted an allotment of Indians by Diego Columbus. Padre las Casas was the first to hold mass for the Indians in the Americas. A sermon of Fray Pedro of Cordova in favor of the Indians helped to unite the fight in the defense of the exploded Taino Indians. He intervened with the head of the Dominican priests to look for the solution to the problem of the indigenous peoples. As of that moment, the young priest became the lawyer of the mistreated Native race. With that aim he traveled to Spain, where he met with King Fernando the Catholic, at the end of 1515. He gained nothing with that interview. After the Death of King Fernando, Cardinal Cisneros replaced him in the Court. 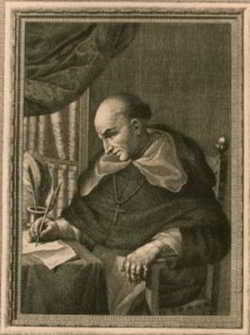 Finally, with Cardinal Cisneros at the head, Bartolomé was able to form a group, administered by Spaniards and helped by monks, to aid the indigenous peoples of the island. Still, the people in charge did not want to give freedom to the Indians. Las Casas returned to Spain, where meeting with the new Monarch Carlos V, proposed new plans to improve the life of the Indians. One of the proposals of the Father the Houses was the one to replace the indigenous population with black Africans. This proposal was accepted but it did not improve the situation of the Indian. 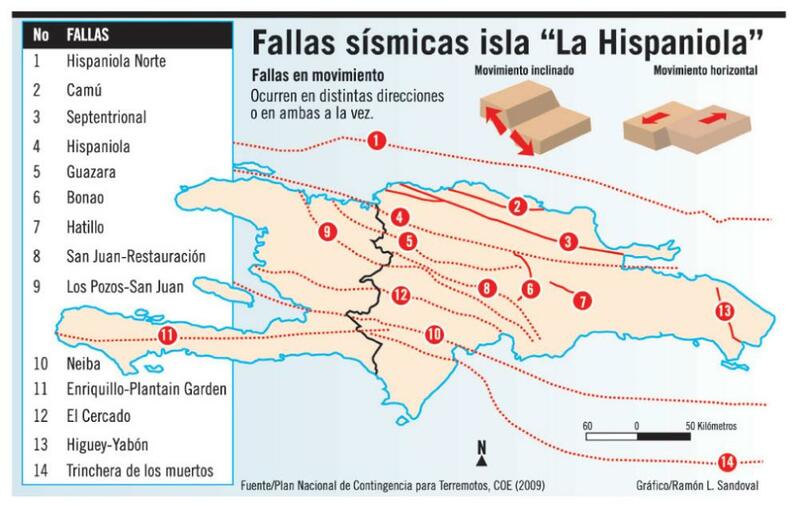 The Indians of Hispaniola disappeared quickly, in spite of the effort of Las Casas to protect them. When there were very few indigenous Indians left on the island Las Casas went to the newly conquered territories and continued with his defense of the natives. He was against the violent conquest of the territories and always protested against the great slaughtering carried on by the conquerors. Las Casas fought in several locations of South and Central America trying to prevent the extermination of the Indians. While in Peru he preached against the violence of Pizarro in the conquest of the Incan Empire. For this reason he was transferred and imprisoned in Santo Domingo in 1533. Bartolomé continued his fight in 1535 when he was released from prison and continued on to Central America. In Guatemala he made an attempt of pacific conquest. Las Casas fought for the rights of the Indians until his death in July 1566. He wrote several important works about the conquest and Spanish colonization in Las Americas. The books “Apologética” and the “Historia de Las Indias” (History of the Indians”) are the most recognized. In his will he signed over all his writings to the College of San Gregorio. 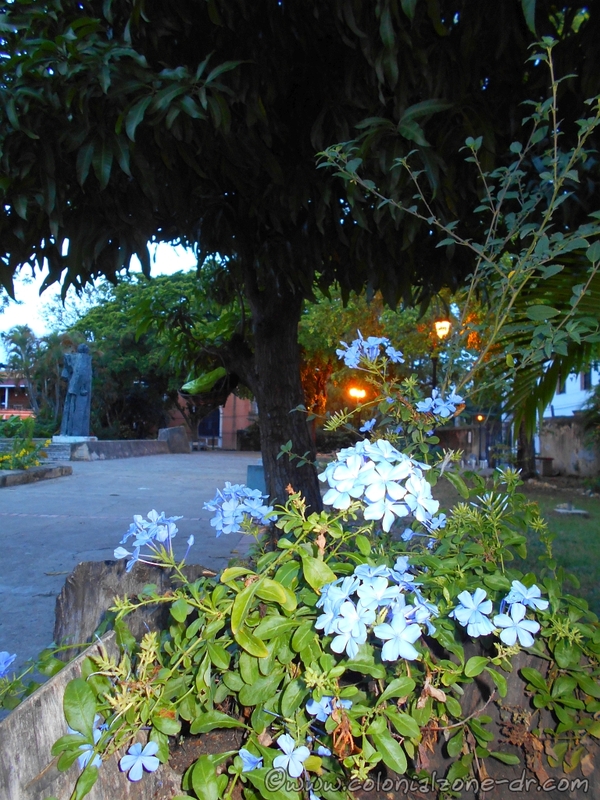 There is a small and beautiful plaza in the Colonial Zone honoring Las Casas. 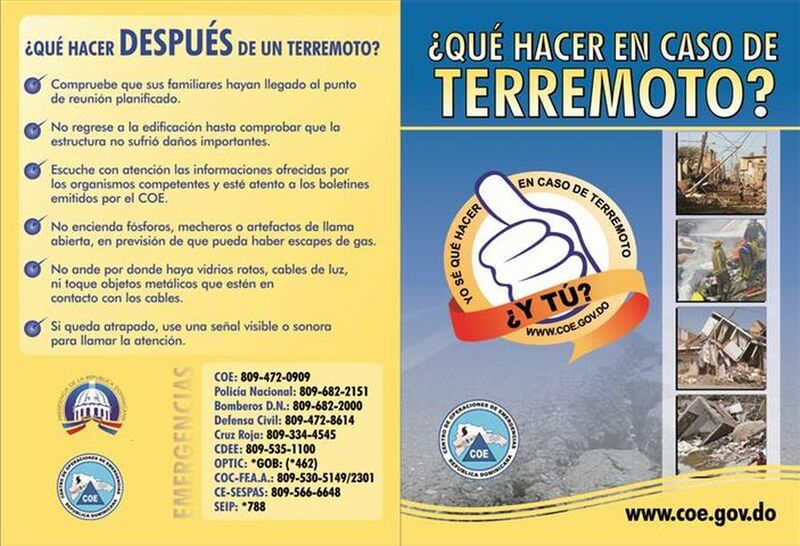 It is located on Calle Padre Billini between Hostos and Arz. 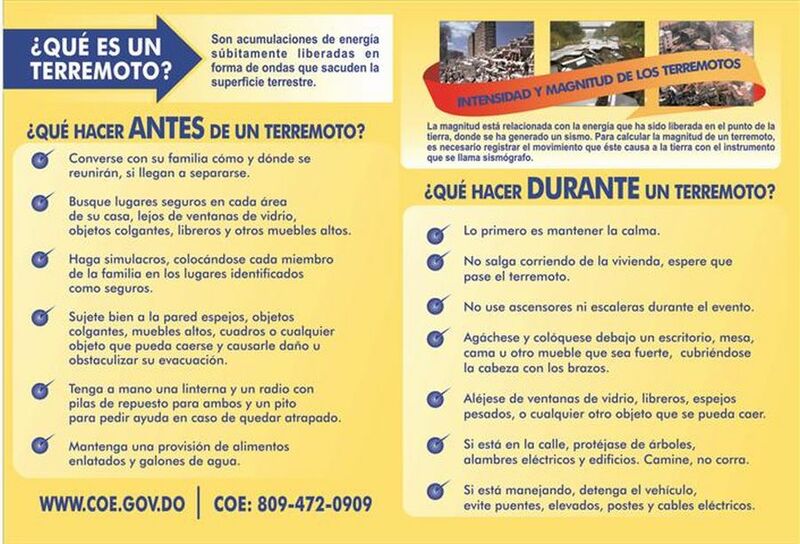 Meriño.